So, my birthday was on the 19th. I'm now 23! Go me! I promise I'm a real adult. I DO MY OWN TAXES, GOD DAMNIT. 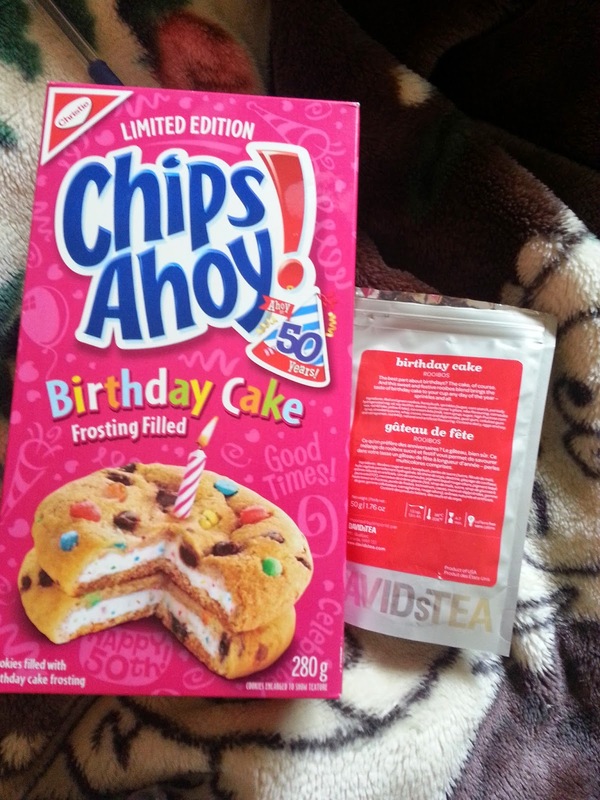 And because all birthdays need birthday cake, I decided to up the anti and have not only cake flavored cookies from my lovely tea sister, but a TEA that is all about the birthday cake. It's my birthday, I make the rules now! Birthday Cake tea from DavidsTea. So this tea is much more cake scented than flavored. It tastes basically like a sweet rooibos tea. Which isn't a bad thing at all. I enjoy the tea. But, I don't have it often because the smell can be overwhelming when made in my than a cup. If I make a pot, then I tend to be overpowered by cake-tea smell! THIS REVIEW IS SHORT BECAUSE MY BIRTHDAY.